I think these types of outfits are my hands-down favorite. Crisp color combination, casual jacket and a bit of oomph added with the accessories. Not too fussy, not too casual, but just right. love those gold cuffs! You look great! LOVE this look - so casual, yet so perfect. I agree! You look great! Love your cuffs and purse are amazing, they totally lift up your whole outfit!! Those gold cuffs are so cute! Very "Wonder Woman"-esque. I just did a post on the double cuff trend today - check it out! Crisp, clean and defititely worth being seen in this outfit. Love the pants. Loved them with the printed shirt recently too. I finally got some cuffs after drooling over yours:) and love the light denim jacket, perfect for spring. You look so comfy and chic in this outfit! Perfectly balanced and structured outfit! Love th added gold cuff and the shoes! Very nice casual outfit. I like that you shop all over and this look reflects that. I totally agree, any outfit that is easily styled is definitely my favourite! Oooh Krystal you've really made me want a light wash denim jacket!! You always wear the most perfect colours for your hair - and I love this combo of soft brown and white!! This outfit is so chic and pulled together. The shoes work perfect! LOVE that color on you! I was hesitant of buying a blouse similar in color because my skin is slightly tanned like yours. But It looks great! I love how you paired it with white. loving the outfit for sure! so classy! Definitely a perfect mix. You look lovely. love that shirt! such a great color! Love this chic casual look! Those pants are perfect. I love this casual chic look! The comfy fit of the pants and shirt make me want to wear something like this! Cute look! Definitely love the casual cool feel of it! Very cute and casual. And your hair is growing! It looks really good. i love the way that clutch goes with the shirt. very cute! So the perfect combo, love the white pants with the bleached denim, the look is fab! The arm cuffs look fab & give the outfit an edge! Love those kind of simple but effective outfits!!! Love the army green with those open toe sandals a lot..sophisticated pairing. These are my favorite outfits too! ¡Every day I rather like your looks¡ ¡Very elegant outfit! Such a cute and classic look! Denim jackets go with everything, don't they!? Love your blog!! Can't go past denim jacket & white pants - great look! This has to be one of my favorite outfits you've posted! 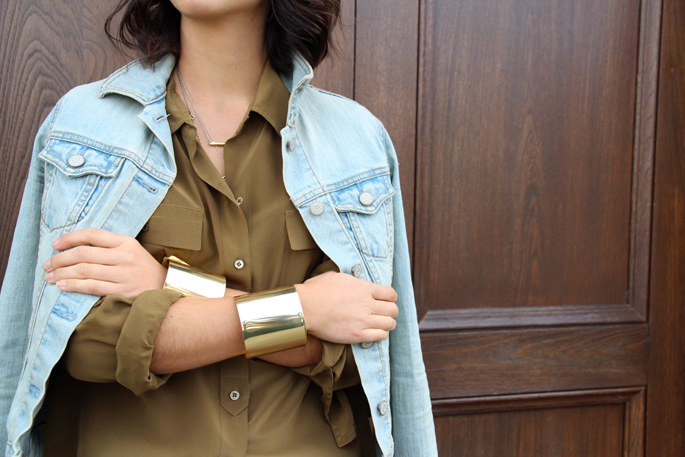 Love that blouse with the jean jacket and gold cuffs! Gorgeous combo! And love the pop of yellow. This makes me yearn for spring/summer when my go-to cover-up is a denim jacket! You are absolutely right, this outfit is just perfect. loe the bracelets. So gorgeous. I am madly in love with that bar necklace--I now stalk different H&M stores hoping that they will re-stock it at some point so I can own it...so simple and so perfect! Those cuffs are so gorgeous! i love everything about this look. The white slacks, denim, brown and pop of yellow. Just FAB! I LOVE your blog! Seriously all of your outfits make my day :)! I just cut my hair a little bit shorter than yours and was wondering if you could do a post explaining how you style yours in the wavy bob since m hair is pin straight! Please!!! i love those j crew silk blouses, they just fold and blow so perfectly! i love the look of white and demin, so summer! Love the colors together, and the fresh kind of vibe in the look. Love the color combination! And your hair! so lovely!